A Wimps Guide to Orthognathic Surgery: Late Tooth Update! Well it's a bit late but a couple weeks ago, I had a really wobbly and sore tooth it was my first pre molar on my left side, top set of teeth. The canine on my top left is still a baby tooth, so it's not braced it had a spring over it, now just a wire. So after sort of playing with it all day with my tongue, asking my colleagues at work "does this look normal?" (wiggles tooth) and obsessively looking in the mirror and being horrified by how much it moved - up and down in the socket forward and back, I was convinced the only thing holding it in was the fact that it was braced and wired to my other teeth. So really cleverly I finally decided that it wasnt normal to have a tooth that moved that much. and at 4pm on a Friday to phone the Max fac unit up at the hospital and try to see my orthodontist, not surprisingly at 4pm on a friday afternoon there wasn't an orthodontist available. I did speak to a lovely dental nurse who told me to go and see a dentist straight away, she had me booked in to see Mr O Monday afternoon. I got to see my dentist Saturday morning. He had a poke and a wiggle of the sore tooth, then asked me if I wanted to keep my baby canine next to it or have it removed during surgery? "yesssh a van de kep itch!!!" was the panic stricken, fingers in my mouth answer i gave him. His response was a very nonchalant "oh, ok then" My wobbly tooth was fine, no reason to remove it, just had to see my Ortho to sort my wires out. I spent the weekend worrying about loosing my little baby canine, then went to see Mr O on Monday and he said that it was loose because of the way my bite was. Every time I bit down or closed my mouth my bottom teeth were pushing that top tooth causing it to move all the time and stabilise in it's socket. So he put a kink in the wire either side of the tooth to lift that tooth out of the way. He said it will hurt for a few days but it should help it settle and stop it catching on my bottom teeth, then once I've had my surgery he will pull that tooth back down and it should fit nicer once my jaws are realigned. I also had a power chain fitted! My first piece of additional hardware! 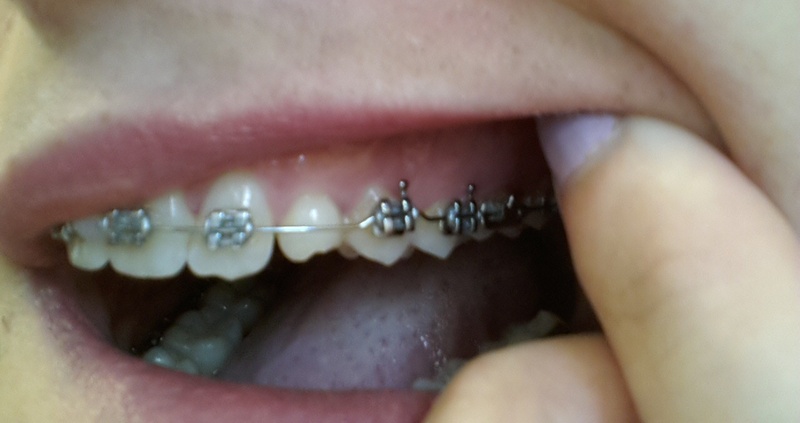 the power chain is to close a gap in my bottom front teeth, it hasn't hurt too much at all, it is closing that gap but also opening up a bigger gap on the other side, but I guess the power chain will move along a bit at my next appointment. I was really quite lucky, because I was meant to have an 11 week wait in between appointments, but with my wobbly tooth I ended up getting a sneaky appointment in the middle of it! Yaaaay! My wobbly tooth has moved up and out the way, the pain from that tooth moving was incredible! Worse tooth pain yet, reduced me to liquid/soft food again for a week but I survived it and now I don't have a wobbly tooth! I have a 4 week wait to my next appointment, I'm hoping to get a bit more a firmed up date for surgery, last time it was 22nd of October, but I was told that could change. I will just have to wait and see, hopefully I will get something in writing, so I can start planning! Were you by chance at Eastbourne this weekend? There was a girl who looked dead like you!!! I’m glad you survived that stage. 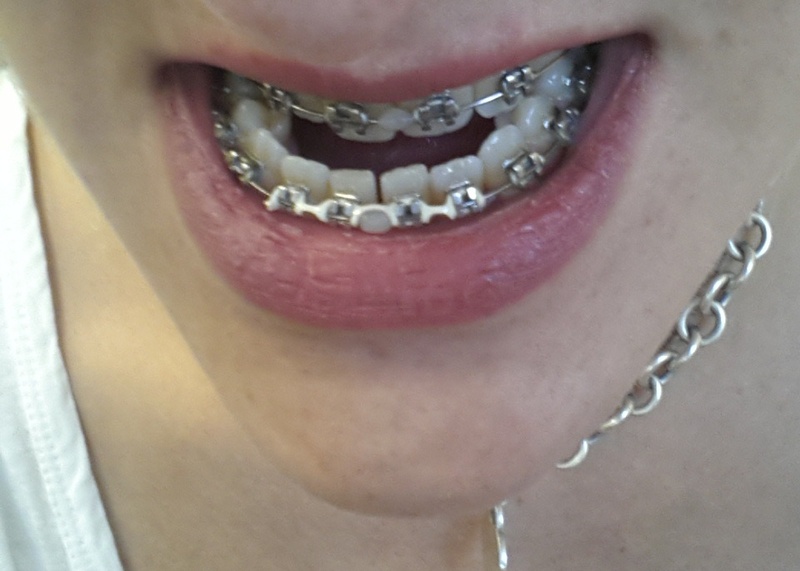 Having braces on is such a huge challenge to face, but I’m certain you’ll be able to overcome those things. Just follow your dentist's advice and you’ll be out of braces soon. A few sacrifices, like avoiding your favorite kind of food for the meantime, will be worth it.